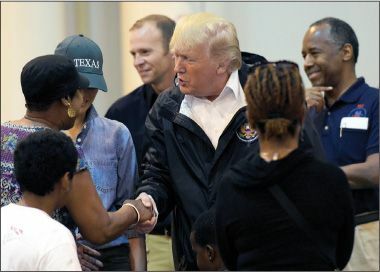 Trump meets hurricane victims at a Houston shelter. Tens of thousands of flood victims were returning to their waterlogged homes in the Houston area this week to start a massive cleanup effort in the wake of Hurricane Harvey—now officially the second-most destructive storm in U.S. history. At least 70 people were killed when Harvey dumped more than 20 trillion gallons of rain on Texas and Louisiana, destroying up to 40,000 homes in the Houston area alone. As President Trump made his second visit to Texas to comfort victims, concerns grew over the city’s floodwaters, which are believed to contain a dangerous mix of sewage and pollutants from flooded oil refineries, chemical plants, and at least 13 nearby Superfund toxic-waste sites. Texas Gov. Greg Abbott said that damage from Harvey could total up to $180 billion— more than Hurricane Katrina. “This is going to be a huge catastrophe that people need to come to grips with,” said Abbott. The House overwhelmingly approved an initial $7.9 million Harvey aid package. Trump backed a Democratic proposal to add provisions to the relief measure that would extend government funding and raise the debt ceiling until December, in order to avert a fiscal showdown at the end of September. The announcement blindsided GOP leaders, who wanted to raise the debt ceiling for 18 months to avoid a divisive political fight ahead of the 2018 midterms. Meanwhile, the Coast Guard moved helicopters from Texas to Puerto Rico and Florida in anticipation of Hurricane Irma, a huge Category 5 storm expected to hit the U.S. over the weekend. “As soon as one ends, we need to make sure we are ready for the next event,” said Adm. Paul Zukunft, Coast Guard commandant. Lawmakers should aim their fire at the federal National Flood Insurance Program, said Jeb Hensarling in USNews.com. Harvey wouldn’t have caused so much damage without the subsidy program, which gives people “perverse incentives to build and re-build homes and businesses in flood-prone areas.” In one case, the NFIP paid nearly $1 million to rebuild one $120,000 Houston home that flooded 16 times in 18 years. It’s insanity.